Only the first half of this piece is shown. The words of Led Zeppelin’s song ‘Stairway to Heaven’ were the starting point for this piece. We used 'twisted’ letters (an alphabet we had been working on for some time and also used for ‘Sean at the Seaside’) to suggest movement and carved the stripy background to imply steps. 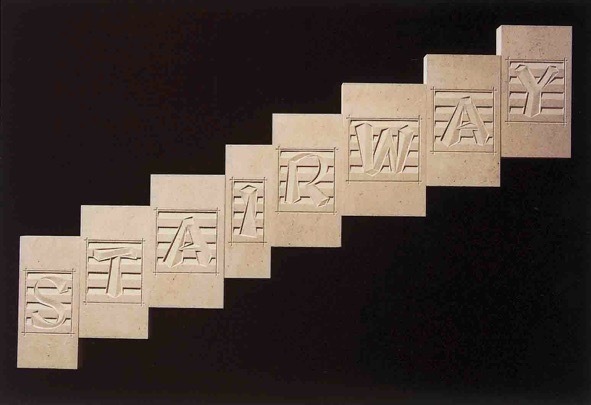 The pieces of stone are arranged so the top of each stone links up with the carved letter inside the next stone, and thus they become a virtual staircase stepped up the wall, suggesting that maybe heaven is above.